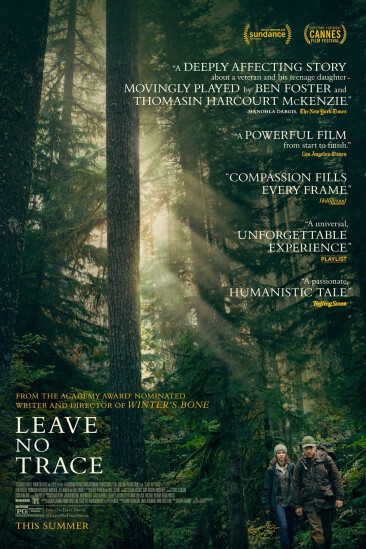 WHAT I LIKED: Debra Granik's 'Leave No Trace,' is probably the most cinematic film released in 2018, as it relies almost exclusively on visual storytelling and physical performances rather than dialogue to tell its hugely moving story of a homeless daughter and her father. What's so great about that? Well, there's ten times more power behind a look or a simple exchange than there is behind a bunch of scripted lines outlining the plot or the themes on display as it's closer to the realities of human interaction. That's what cinema is built for - it is a visual art after all - and that utter confidence in the camera and the performances here makes for something truly investing that also shows a huge amount of confidence in its audience to not need everything spelt out. That's epitomised by the final scene where we know exactly what's happening with just a single word and a visual exchange between the two central characters, and that moment alone is enough to bring you tears. The whole film is executed in that way though, and it will not only have you caring for the characters as a result, but it will also have you pondering the realities of homelessness and the machine-like expectations of modern western life all without ever explicitly discussing those things in the script. Couple that with two brilliantly understated performances from Ben Foster and Thomasin McKenzie (they need to be good when so much of the storytelling relies on them) and in the end what you've got is one of the best and ultimately cinematic films of the year. What an incredible piece of work. WHAT I DIDN'T LIKE: It might have hit harder if we'd have got to know the central relationship a little better before it was tested ten minutes in. VERDICT: The most cinematic film of the year, 'Leave No Trace,' is a lesson in "show don't tell" as Debra Granik leaves this powerful story in the hands of her camera and two spectacular physical performances. This is one of the best films I've seen in a long time, actually.